must be rated for a minimum of 250mA current output, although you will likely want something more like 500mA or 1A output, as it gives you the current necessary to power a servo or twenty LEDs if you want to. the plug must be “centre positive”, that is, the middle pin of the plug has to be the + connection. You can easily get plenty of power adaptors for Arduino in the Shop or Junk shelf at ITP. But You might need to aware of the polarity of the power supply. 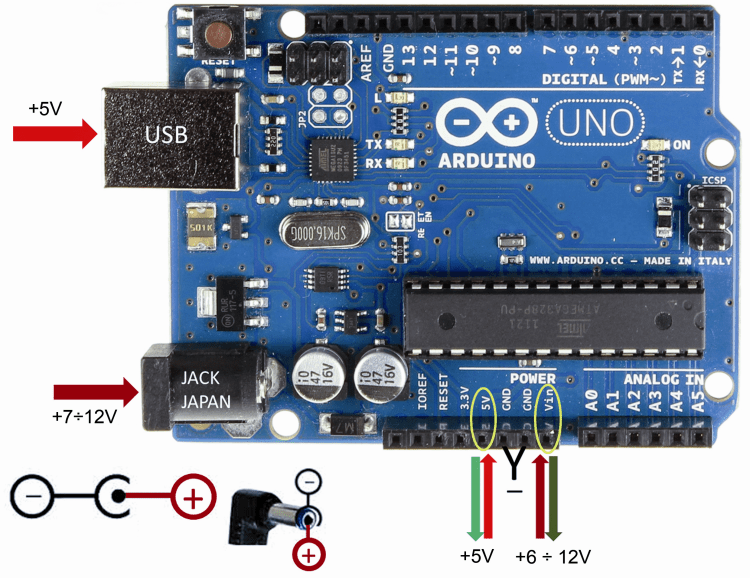 As you can see the above picture, the power supply for Arduino has to be positive inside (Center- positive(+)), and negative outer side of (Outer- Negative(-))the jack. There are a few adaptors are not the same polarity of this, and it won’t work with your Arduino. Using a 9-12V power supply with Arduino power jack.